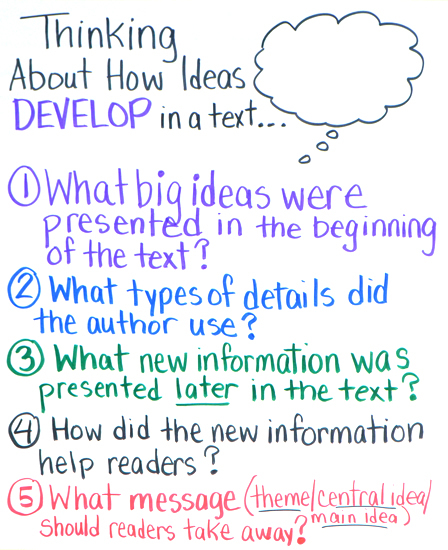 One of the big challenges for students is being able to understand what “develop” means in reference to a text. These five simple questions encourage students to consider not just the main/central ideas, but the supporting details, how the ideas evolved over time, and what messages may have been woven throughout. Introduce this to your students by presenting the blank chart with only the title and thought bubble added. Do not be tempted to simply add each question and discuss. You want to gradually do this as you share a text together. I like to select a text that I can quickly read out loud with students. I typically choose a newspaper article. The informational text found in student magazines are also great choices. I pass out a copy of the text to each student, or project it on an interactive whiteboard or overhead projector. Next, I tell my students that we are going to think about the way that readers interact with the ideas in a text. I read the text out loud, then I ask students to look back at the beginning of the text and think about what big ideas they noted. If you teach elementary students, use “main idea” for your terminology. If you teach middle-school students, use the term “central idea.” We share our ideas, point out evidence to support the ideas we have identified, and come to a consensus. After this discussion, I add the first question. I make it very clear that this is what you do first. We follow that same procedure as we work through the rest of the text and other questions. Tyler,Tx! Just wanted to say keep up the great job! We’re struggling with RL.2. Some teachers believe there is a slight difference between theme and central idea in literature while others believe it’s the same. We’ve search several sources that give conflicting responses. We’ve also had many conversations about whether or not an objective summary supports the theme. We’d love to know your thoughts.